Voltaire and Rousseau, run by brothers Jo and Ed McGonegal is an unassuming treasure trove of literary delights providing book service in the West End for the past 30 years. Voltaire and Rousseau not only provides an affordable way for students to purchase course materials, a range of literature from French or Gaelic poetry to gardening manuals, but is also renowned throughout Scotland and the world as a place where discoveries can be made. Not long ago an original copy of Blake’s Poetical Sketches, complete with engravings was found after some digging about in the book filled crannies of the shop. It is perhaps the higlety-piglety piles of roughly genre-fied books where one can unabated while away hours in bookwormish pursuits that really creates the magic of the shop. It seems that the owners of V&R are unaware of the real gems they have because they are too busy shoring up the walls of books from collapsing! There are some quite notable and varied book worms who frequent or have frequented V&R. Alistair Grey, A.L. Kennedy, Bernard McLaventy, Tom Leonard, Barry Humphries, Dennis Healey, Pat Kane, Rev. Ian Paisley, Alexander Trocchi (deceased), Margaret Attwood are just some of the more famous people who have been customers. After purchasing a tome then what better than to pop round the corner and pore over it with a cup of tea in Tchai-Ovna, again another hang out for writers, poets and bookworms. You can sit for hours over a pot of tea with a book in one of the comfy chairs and again no one will bother you, continuing the relaxed, unassuming ambience of the lane. Here there are also literary events and poetry readings, such as my own and my brother’s legacy, the Magic Carpet Cabaret, introducing the latest in new writers and musicians to the Glasgow Scene, including Christie Williamson, The Grey Earl, Chris Floyd and David Manderson, and the long-established “Reading the leaves”, which attracts writers and enthusiasts from around Scotland, with such writers as Alan Jamieson, Anne Donovan, Dave Manderson, Loiuse Welsh and Tom Leonard to name just a few, making appearances and performing. 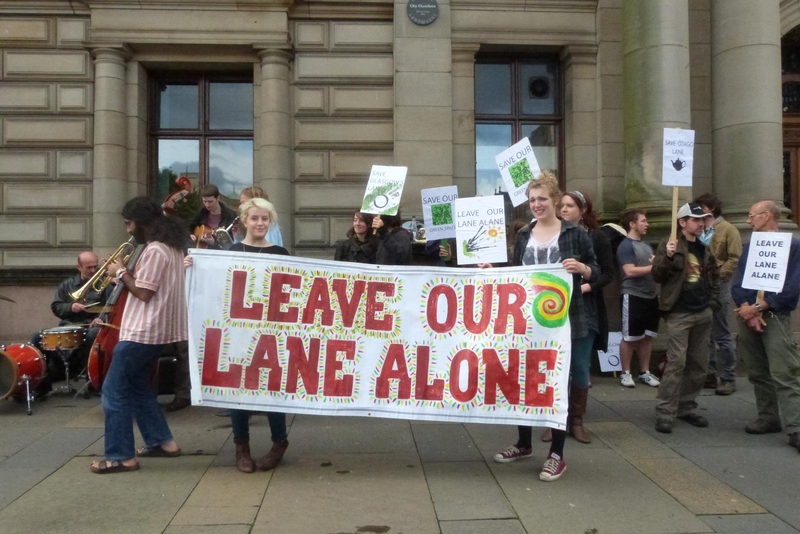 The loss of the lane will not only be a loss of livelihood for those who work in these establishment, it will mean the loss of the literary hub of Glasgow, a virtual cultural eclipse.